PE1610 bias tee (also called bias T) has an 2.4mm connector RF port that is female gender. This Pasternack female 2.4mm bias tee design is rated for a minimum frequency of 0.1 MHz and a maximum frequency of 50 GHz. 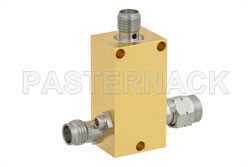 Our RF coaxial bias tee has a sma DC port connector with a female gender. This 2.4mm bias tee / T is rated for a max. DC voltage of 25 Volts and a max. current of 150 mA. 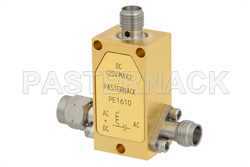 The PE1610 bias T with 2.4mm connector series for RF port is designed with a maximum VSWR of and a RF to bias isolation maximum of 50 dB. Pasternack's radio frequency bias tee is one of over 40,000 RF, microwave and millimeter wave components supplied by us. Our coaxial 2.4mm bias T can be purchased and will be shipped worldwide the same-day as with other in-stock Pasternack RF parts.